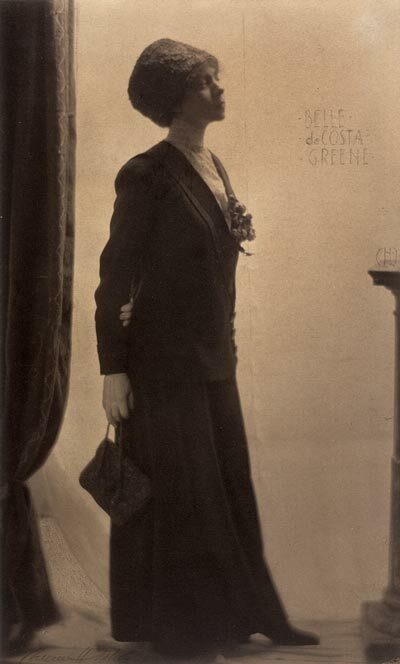 In 1905, Morgan hired twenty-six-year-old Belle da Costa Greene, a librarian from Princeton University, to manage and augment his collections. Greene was a woman of color and the daughter of Richard T. Greener, a prominent educator and the first African-American to graduate from Harvard College. Although she would work with Morgan for only seven years before his death in 1913, Greene transformed Morgan's collection and quickly became a leading figure in the rare book world. For example, in 1908—during her first trip to Europe—she famously orchestrated a secret pre-sale deal to secure a group of coveted volumes printed by William Caxton. After Morgan's death, Greene continued as private librarian to his son, Jack, and when the Morgan Library become a public institution in 1924, Greene was named its first director. She would hold that position for twenty-four years, until her retirement in 1948. Not only did she build one of the most important collections of books and manuscripts in the United States; she transformed an exclusive private collection into a major public resource, creating the Morgan's programs of exhibitions, lectures, publications, and research services. She died in 1950.